As a proud member of Cubicle Nation, I spend more time in my cubicle than anywhere else, at least during the work week. I am an individual contributor in my place of employment and that is actually the way that I like it. The managers in my company either have a larger cubicle with a door or they have an actual plaster-wall office, a door, and a window. I’ve had the luxury of having my own office with a door and a window that I could open in a previous job. But with that office also came more responsibilities and having to give reviews to the employees who I managed. I’ve had it both ways and I prefer residing in a cubicle if the office-with-a-door means I have to be responsible for others. So, since I know that my cubicle office space isn’t going to change in the short-term, I took it upon myself to figure out how to make the best of a small situation. I did it by finding the right cubicle accessories and cool office supplies. One of those cool office supplies I recently purchased is a rear view cubicle mirror which I absolutely love! But, as far as the size of my office is concerned, one way that I have been able to optimize that limited amount of space is to implement cubicle shelves in my office. So what are your options? If you have been reading my articles on this site then you know that this article introduced a rather unique type of cubicle shelf which actually is attached to the walls of a cubicle. This type of cubicle shelving comes with a set of stainless steel needles that are affixed to the back of the hard plastic shelf. These needles utilize the same concept as panel clips that I discuss in this article. 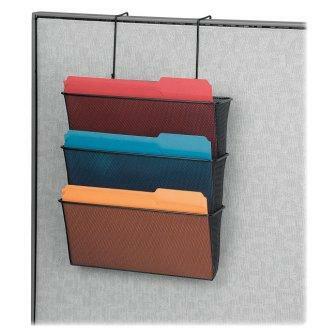 Panel or cubicle clips have pins on the back of the clip that point downward and sink into the grey cubicle wall fabric. The shelf mentioned here utilized 5 sets of stainless steel needles that adhere to the shelf and then the unit is secured to the walls by way of these needles. Fellowes Plastic Partition Additions Shelf that is attached directly to the cubicle wall. Fellowes Partition Additions Letter Tray also attaches to the cubicle wall by way of stainless steel needles that are affixed to the back of the shelf which is the same hardware as the shelf on the left. I’ve had my cubicle shelf for over a year and it has never wavered. It is recommended not to put more than 5 pounds onto the shelf which works perfectly for me. I can place pictures and other items onto the shelf that otherwise would’ve been on my desk. Another shelf, called a hanging letter tray uses the exact same concept and I write about it here in a lot more detail. The hanging letter tray is basically the same as the cubicle shelf mentioned previously but the dimensions of the letter tray are a little different. The paper tray projects outward from the wall a little further which allows you to place a file folder, for example, on its surface. I actually store disinfecting wipes and dust remover on this surface because it gets them up and out of the way. Since I wrote this article, I have purchased a hanging corner shelf unit which also uses the stainless steel needles to attach to the fabric of a cubicle wall. Since all cubicle walls typically have similar dimensions, there are a number of different cubicle shelves that you can hang from the cubicle walls. This type of cubicle shelving actually uses the top of the cubicle walls to anchor the shelves which allows it to hold heavier items if need be. I used a set of trays called the Fellowes 75310 Wire Partition Additions Triple Tray and talked about it in more detail in this post. I must say that I use this triple tray all of the time to hold paperwork that I need to quickly access and that used to take up space on my desktop. 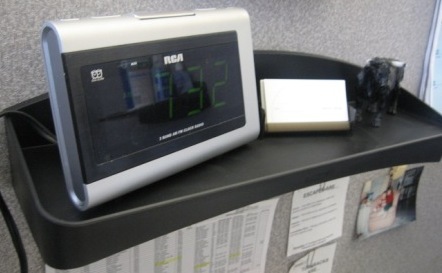 I actually performed an experiment recently by removing the trays for about a week from my cubicle walls. I noticed that everything that used to go into the trays were now sitting on top of my desk. Needless to say, I put the trays right back up on my cubicle wall and my desk instantly became free and clear of clutter! I think it's a good thing to experiment at times by removing items from your office that you aren't sure whether or not you need them. In time, you will be able to make the decision as to whether or not they are truly useful. 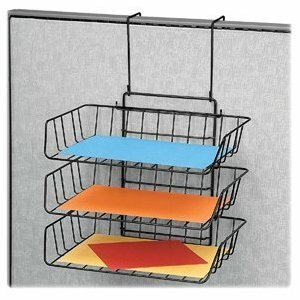 Fellowes 75310 Wire Partition Additions Triple Tray hangs conveniently from the top of the cubicle wall as does the triple file pocket on the right. Both of these convenient cubicle shelves allow you to store items on the walls of your cubicle as opposed to your desktop. I do not own the triple file pocket but my co-worker in the next office does and she loves it for organizing her file folders. It allows her to label the unit and easily access those folders when she needs them quickly. There are a variety of desktop cubicle shelving options that are available for not only a cubicle but any office desktop. I wrote about a corner shelf unit in this post and what was so great about that shelf is that you could also use it on its side in a different configuration. 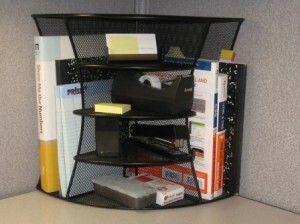 Safco Products Onyx Mesh Desk Corner Organizer – this unit can also be used on its side which adds to its versatility. 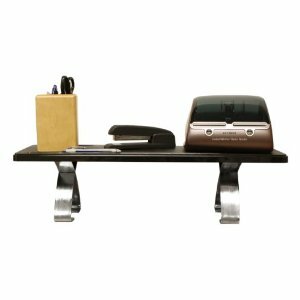 Rubbermaid 15066 Image Series Off-Desk Shelf – this unit allows you to store items not only on top of the desk shelf but also below it which adds to the space in your cubicle. The shelf on the right above is very similar to the one that I have in my office. What I love about unique cubicle shelves like this one is that they allow me to store items above and below which you will see in this post. Any way that I can optimize the small amount of space that I have in my office is always something that intrigues me. 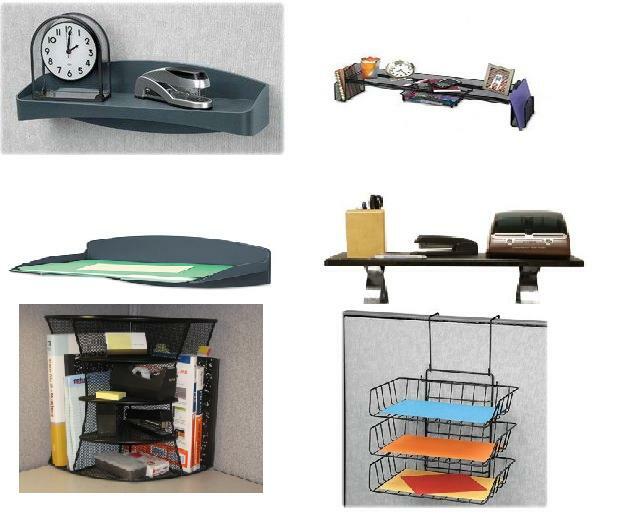 There are many different options that you have as far as cubicle shelves and cubicle storage are concerned. Do some research and you should be able to find the right shelving for your office or cubicle. If you have any questions at all about any of the items shown here or anywhere else on this site please don't hesitate to contact me or to leave a comment. Thank you for your site. I am an office supplies “junkie”. Not junk but you get the message. I don’t have a cubicle since I don’t work. However I would love to set one up in my home because if all the cool items on your blog!!!! Thanks Ethel! I appreciate the kind words. I’ve spent many years trying to make my cubicle the best it can be and it is constantly evolving every year. I think you can actually buy cubicles fairly easily if you want to use one as a home office. I have thought about this myself!